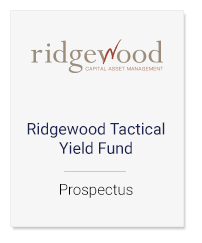 The prospectus is a legal document issued by the Ridgewood Tactical Yield Bond Fund to provide details of the fund to potential clients. It provides a description of the fund's strategies, the manager's background, the fund's fee structure and its financial statements. A copy of the fund’s prospectus can be found below.